Ampeg SVX, Software Amp Simulator from IK Multimedia. stompboxjon's review"Took my bass to a new level"
The Ampeg SVX Plug In comes with 4 modules; tuner, amp, cabinet/mic, and stomp. There are also 6 mic models, 24 bass amp combinations and 8 analog modeled stomps. This is one of the best plug ins that I have ever worked with for my bass. They quality of the amps/models are amazing. This is a must have for anyone who is a producer and engineer for bass tracks. Installing these plug ins where pretty quick and easy the only issue is that I was experiencing some crashing with some of the amps and then Ampeg would not give much support on the issue because they said “They no longer make these plug in”. So be very wary of that, this had me very upset because I feel like they should have at least helped me trouble shoot. I was not sure if the person on the phone really knew what they were talking about or not. I eventually had to uninstall and reinstall everything to get it back to normal. My favorite cabinets are the SVT-410H and the BA-500, these are the two that I use the most and I love the sound they create. These cabinets give me the best bass out of most any of the plug ins that I own or have even used. IK Media also makes another plug in called “Metal Studio” which is also a great plug in, though it doesn’t feel like it has as many options as the SVX plug in does. 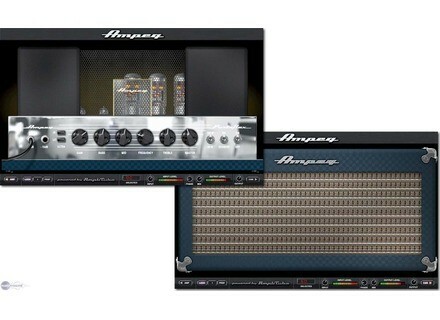 The price of the Ampeg SVX was very reasonable when it first came out and that was the reason that I purchased it. I ended up falling in love with the sound it gave to my bass tracks, it really helped them stand out in the mix and sound full and rich as opposed to thin and dry. It really took me to another level! tarrtime's review"Don't Waste TIme or $ with Other Bass Amp Sims"
Amplitube Ampeg SVX is an expansion pack for IK Multimedia Amplitube. With the introduction of Amplitube Custom Shop, individual amp models in this package can be purchased separately rather than as a bundle. Ampeg SVX is specifically for bass amp simulation. This software is easy to use if you know your way around Amplitube. If not, it can take a little bit of getting used to. There are a bunch of different screens to sort through, and the routing can be a bit confusing. However, once you figure out the initial navigation of the plug-in, it is pretty easy. The software is laid out like a typical bass guitar signal chain - stomp boxes, amp, cabinet, mic, rack effects. My opinion is that the stomp boxes and rack effects are not very useful in this package. However, I am a bass player that typically believes in plugging my bass directly into the amp anyway. If I use any effects pedals with this software, I typically use the pedals that are from Amplitube, and not the Ampeg pedals. Ampeg SVX is the only bass amp simulation software that currently matters. Modeling of bass amps is mostly an after-thought in Guitar Rig, Eleven, etc. Although Pod Farm has a lot of different bass amp models and cabinets, they really can't compare to the sound quality in Ampeg SVX. Even the other bass amps in the regular Amplitube 3 fall short of Ampeg SVX to my ears. I haven't tried OverLoud Mark Studio 2, so I can't make that comparison. Don't waste your time or money, just buy this software. I think it is pretty cheap these days. Unless you have access to the real ampeg amps, just run your bass direct and use these amps sims. IK Multimedia's Ampeg SVX is a bass guitar amp modeling plug-in that can be used in a variety of formats. It's compatible on both PC and Mac operating systems, as well as for VST, RTAS, and AU plug-in formats, as well as having the capability to be run as a stand alone piece of software. I wasn't involved with installing this plug-in at the studio where I work, as it was already being used before I started working there. As long as you have a compatible system, and most users will, you should be all set as far as installation is concerned. The interface of SVX has a few different parts to it, as it's possible to change all sorts of parameters. There are four main screens inside of the plug-in - an amp head, a speaker cabinet with choice of microphone type, a tuner, and a virtual effects pedal board. There are many different modules to choose from within each of these windows as well. Even with all of this control, the interface is still very user friendly and easy to understand. A manual most likely won't be necessary for most users. While I haven't had too many major issues with the IK Multimedia Ampeg SVX in terms of performance, it definitely is going to take up a good amount of processing power when you use it. At the studio where I work we run it within a Pro Tools HD system, so we don't really have any issues running it, but occasionally it will freeze up if I have a few of them going which isn't very often. If you're running it in an LE system, you're most likely going to want to print your sounds as much as possible, of course depending on what kind of system you have and all that. Overall, the IK Multimedia Ampeg SVX plug-in is a very powerful one. There is a ton that you can do with it, a lot of which I've yet to explore into. In general it has a very realistic and believable sound, which for me is the main thing to look for in amp modeling software like this. There aren't as many bass guitar amp modeling plug-ins out there as there are for guitar, making the IK Multimedia Ampeg SVX all that more sweet. I don't use this on every song, but it's awesome to have around when the bass is not as happening as it could be. A few times when I thought we might of needed to do some parts again to get a wider sound, the Ampeg SVX plug-in saved me. For only $100 USD, IK Multimedia's Ampeg SVX is a great addition to a studio of any size. I do not have, I just had the chance to try this Ampeg amp simulation. The interface is simple, clear and accessible.Ici, there is no 40 amp models and cabinets and 20 effects. 4 amp models-quality effects + 7 a volume pedal, incidentally a tuner and a metronome, and There's already a lot of fun and food for pofiner sound. If not, contrary to what is stated in the notice below, the Ampeg SVX runs STAND ALONE! On the computer when I tried it, no worries, it will run, lz soft does not seem to be too resource hungry. It looks to me stable and very functional. I play with a Fernandes, mounted with active EMG pickups, I'm not a bassist, it's just an instrument that I love and with which I record in my small sketches, rarely more. However, I have had a Bass Attack Hartke from home, and PC, I worked with a Line6 Toneport UX2 from home and a freeware Helian 1stbass (nice but very limited). Well, it's this plug-in I was most excited, what a sound! one would believe! more realistic than anything I've tried, and it really means There's carving his own sound. Here, choose a preset, it starts to ring immediately, unlike Line6 where you have to spend hours adjusting the settings to achieve something to correct or not too bad in the best case. The simulation is certainly a little fewer than Line6 (although the Toneport y'en there are only 5) but they sound warmer and more realistic. And here you can really choose enter a very distinctive sound Ampeg (SVT3pro style) or contrary to something more transparent as models and settings. In short, I conquered, and finally a simulation for bass that sounds great to me. The best I've experienced (along with the bass amp simus are few in software, unlike the guitar electric. IK Multimedia has announced that starting this April, StealthPlug and AmpliTube Fender Studio are now $99.99 / €74.99. 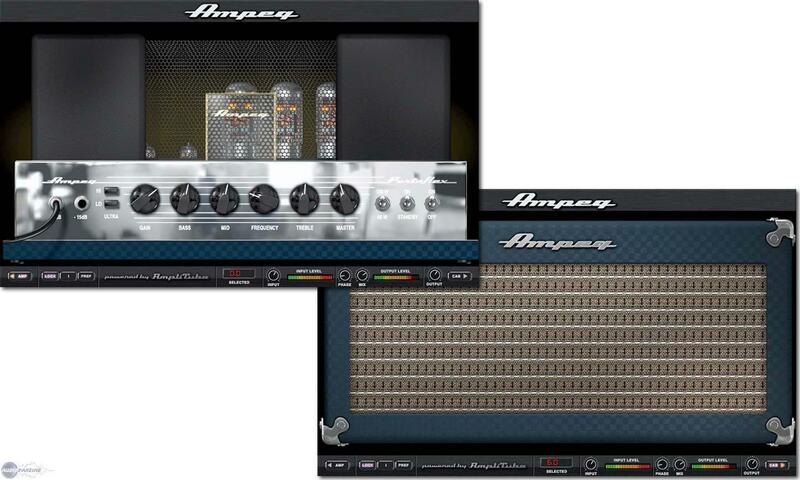 Plus you can also get Ampeg SVX at its new low price for $129.99 / €99.99.